Ask the dispensary to write exactly what they want written on the order in terms of dates for your particular order (with the actual dates that they are requesting). Email this wording to us exactly as it is written with "Flower Order Updates" in the subject line. We will update your order with this information. PATIENT I.D. CARDS - Applying for your Florida Medical Marijuana Patient I.D.? Click here for information. DISPENSARIES / LICENSED FL CANNABIS GROWERS - Read about the licensed FL marijuana growing companies and see their increasing variety and quality of products. 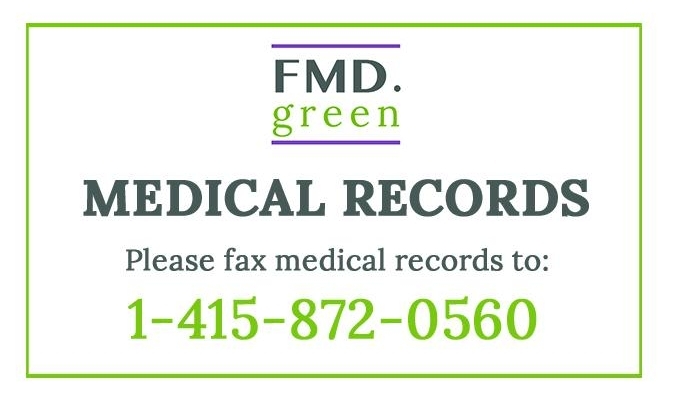 You may fill out and send this Medical Records Release to your other physicians to request that they send us your records. A physician must add the patient to the state Registry before the patient can apply for their ID card. The State must conditionally approve a patient's application before a dispensary will sell marijuana / cannabis medicine to the patient. Be sure to DESIGNATE a CAREGIVER if you would like someone to act on your behalf for purchasing or receiving deliveries of medical cannabis products. ID Application for Medical Marijuana patients in Florida. Online applications are processed faster than paper applications. To apply for your state I.D., Our doctor will pre-qualify you and add you to the Office of Medical Marijuana Use Patient Registry. You should soon receive an automated Email (possibly from MedicalMarijuanaUse@FLHealth.gov - check your junk mail folder) from the State with an application link, and another Email with your temporary password. Use the that link, the Email address you gave our office, and the temporary password to access your profile and complete your ID application. Please remember that the Marijuana Patient ID's are through the FLDOH. Our office does not have information pertaining to the status of ID applications or renewals. Believe us, we'd tell you if we knew! Patients are currently reporting that the state is taking an average of 4 weeks to approve or renew IDs, and weeks or possibly months more to print and mail them. Log on to the Medical Marijuana Use Registry: https://mmuregistry.flhealth.gov/Public/LogIn to complete your ID application, view your application status, and see information about your medical marijuana orders. Read The Endocannabinoid System and Therapeutic Use of Medical Cannabis, THC and CBD, written by medical marijuana / cannabis patient, Cynthia Lan Sears, MS, CHES, CLEC. The article is linked on our site with her permission to use as a resource for other patients navigating their way through medical marijuana / cannabis treatment in Florida and elsewhere. Who is Growing & Dispensing Florida's Medical Marijuana / Cannabis? This is not a pain clinic and we do not sell any products or dispense any medicine. We are a family-run primary care practice focusing on treating those who have tried or considered other treatments for their chronic condition, and would like to try marijuana as medicine. FL Board of Medicine to block MMJ access! Visit www.MMJ4FLA.com to sign our petition and learn more about telemedicine practices. On April 6, the Board of Medicine will meet in Ft. Lauderdale to discuss prohibiting the use of telemedicine - remote treatment via telecommunications technology (phone / video call) - which would require patients to drive to their doctor, wait in a waiting room, and pay higher fees and other associated costs. As we have patients who live all over the state of Florida who have limited mobility and financial resources, we feel that this new law would greatly limit patient access to needed medicine. Read more about the Boar'd telemedicine meeting here. We Passed Amendment 2, but The Fight Is Not Over! "other debilitating medical conditions of the same kind or class as or comparable to those enumerated, and for which a physician believes that the medical use of marijuana would likely outweigh the potential health risks for a patient." However, the State has suggested to ignore this language and instead let the Board of Medicine decide which conditions do and do not qualify for treatment. Read this article in the Orlando Sentinel from Jan 18, 2017, for more discussion on this topic. How Do I Take Medical Marijuana / Cannabis? Visit the dispensary websites for explanations of various forms and their advantages, and contact the dispensaries directly for specific product information and prices. Florida residents, no matter your affiliation, please Register To Vote now. And then Go Vote! Don't forget that absentee ballots are an option for all voters; contact your local election office to request one. Your vote is important. In 2014 the law that would have provided patients with more widespread access to medical marijuana, while gaining a 58% approval by voters, needed merely an additional 2% to become law. News: AMENDMENT 2 PASSED!!! GOOD JOB, FLORIDA VOTERS. BUT OUR WORK ISN'T FINISHED. Has successfully completed the Florida Medical Association course and examination.